The Lumenier QAV-SKITZO Dark Matter FPV Freestyle quadcopter is a symmetrical X, ultra-durable, finely tuned airframe designed for high performance FPV Freestyle flying. 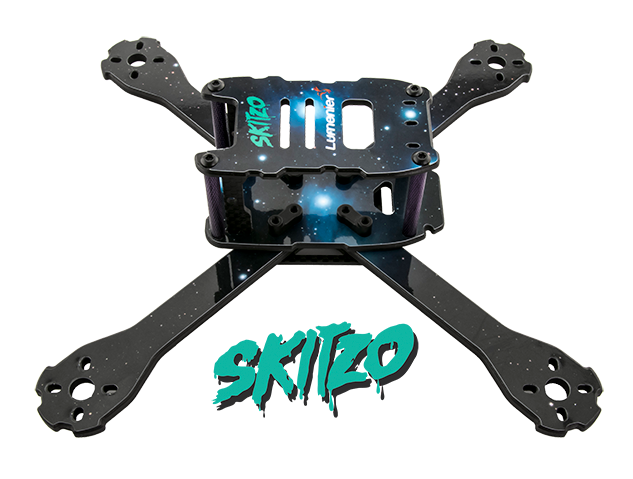 The QAV-SKITZO was created in collaboration with and named after the flow master himself SKITZO FPV. This freestyle airframe has been designed from the ground up to withstand the rigors of freestyle flying like Skitzo put their airframes through. The QAV-SKITZO features premium Lumenier carbon fiber with a beautifully finished chamfered edge, giving the quad a sleek look while also improving the durability by removing hard edges. Each plate is sealed with a layer of clear coat paint further strengthening each piece and giving it an awesome finished look. No rough edges or carbon dust to worry about, and no sanding required. The airframe features removable 4mm carbon fiber arms and 3mm thick top and bottom plates. The arms are sandwiched between the bottom plate and 2mm battery plate giving you an incredible 9mm thick of carbon fiber at the center of the body. Each arm is secured in place with just 2 screws and a threaded aluminum bar on top. This allows you to remove 1 arm by simply taking out 2 screws with just 1 tool. Not only does this airframe fly amazingly, but it looks great too with Skitzo's original astro-photography featured in the custom sticker sheets. Each QAV-SKITZO kit comes with a complete airframe sticker set showing off some stellar space photography shot by Jonathon himself. Pair these graphic frame stickers with the included custom purple spacers for a truly cosmic look! Each 4mm arm and plates are CNC milled out of a solid sheet of premium Lumenier carbon fiber. The outer weave of the carbon fiber runs 100% down each arm of the QAV-SKITZO (0/90 weave), maximizing the strength of the carbon and arms. The center layers are offset at 45 degrees providing even and balanced strength throughout the entire plate. The top plate includes two accessory antenna plates, allowing for multiple cable ties to lock down your antenna in place, or vertically mount your VTX and SMA connector. No more damaging the SMA connection on your VTX. Alternatively you can use the vertical antenna plate, enabling a vertical VTX install on the tail. The top plate also has a cutout allowing access to your VTX button and LED displays for easy channel adjustment. The 3mm top plate has multiple notches along the side making it a versatile mounting plate for a variety of HD camera mounts. The airframe comes with high quality aluminum hardware. All screws are premium, black oxide steel. The spacers have a textured grip surface treatment, which facilitates holding of the spacers during assembly and servicing of the airframe. The spacers are 35mm tall giving you plenty of room for all the electronics to be protected inside. Included with the QAV-SKITZO kit is the popular Lumenier 4Power power distribution board which can be fitted with an optional Pololu voltage drop-down circuit (to 12v or 5v), a XT60 pig-tail. Like the QAV-X and QAV-R, the QAV-SKITZO kit enables mounting of small FPV cameras such as the Lumenier CM-650 in a fully encased assembly which protects the FPV camera during crashes and enables pointing the FPV camera at a wide variety of viewing angles. Full 3K Carbon Fiber airframe with removable 4mm arms. Airframe: 96g (airframe + hardware), 100g (with sticker decal).